During the 1980s the National Union of Metalworkers of South Africa (Numsa) was the figurehead of the so-called ‘workerist’ tendency within the Congress of South African Trade Unions (Cosatu) and has always been on the left in Cosatu. Although Numsa has always been open to internal political pluralism, it inherited the ‘workerist’ politics of the Metal and Allied Workers Union (Mawu), which emerged in the 1970s in a series of encounters between intellectuals and workers. While Numsa itself has gone through a political rupture, which, in a broad sense, saw the union’s politics shift towards the South African Communist Party’s (SACP’s) theoretical and political line, strong elements in Numsa hold true to the ‘workerist’ tradition. Those in the rival political tendency within the trade union movement were dubbed ‘populists’. According to Friedman they claimed that ‘the biggest problem facing workers was white minority rule – only the ANC and its allies could defeat it and so their “workerist” opponents were playing into apartheid’s hands by weakening the fight against it’. In other words, the trade union movement should align itself to the national liberation movement and prioritise the struggle for national liberation as the major struggle facing workers. The populists eventually won the battle within Cosatu and the tripartite alliance came into being in 1992, but Numsa’s politics remained to the left of Cosatu. Famously, in 1993, under the leadership of Moses Mayesiko, a figure always scornful of compromises with nationalists, Numsa passed a motion that Cosatu should split from the alliance after the Constitution had been finalised, and form a workers’ party. This motion eventually was lost at a Cosatu congress. Opposition to it was spearheaded by Num, then Cosatu’s biggest union. The other tactic adopted by the SACP in particular is to label Irvin Jim and the other Numsa national office bearers as ‘the Numsa leadership clique’, who are somehow both ‘ultra-leftists, ‘adventurists’ and ‘business unionists’. They are accused of personally benefitting from Numsa’s investment wing and other unspecified business interests, as opposed loyal cadres like Num President Frans Baleni – who, at the last count, earned over R1.7 million a year, paid to him by the Chamber of Mines. It is with this in mind that an analysis of the current situation with Cosatu should begin. The call for a realignment of the left in South Africa was made by Numsa at the special national congress. Numsa called for the establishment of a united front in an attempt to unite both workplace and community struggles, something not seen since the height of the anti-apartheid struggle in the 1980s. Since the formation of the tripartite alliance and the ANC’s rise to power, it has largely been taboo for Cosatu-affiliated unions to work with community organisations and social movements not afflicted to the ANC, or those that protest against an ANC policy or municipality. Ironically the call for a ‘united front’ was sounded by ‘populists’ in the 1980s, then in in the form of calling for the trade union movement to officially align itself to the UDF . The political division imposed by Cosatu’s alliance with the ANC, which has prevented unions from actively involving themselves in community struggles and forming political alliance with social movements, has perhaps fallen away with this call for a united front, which presents a whole new range of strategic and tactical opportunities and possibilities for the left. Numsa further resolved to look into the potential establishment of a workers’ party, a process which they foresee as taking two to three years to complete. This process opens up a whole new range of debates about organisational forms and socialist strategy in South Africa. Is a mass workers’ party along the lines of the PT in Brazil or Syriza in Greece the correct path, given South Africa’s current political situation? Or is an alternative political formation a more viable path? Debating these sorts of questions will become central over the coming months and years. Numsa’s leadership includes many who grew up in the SACP and held senior positions in the party. Numsa’s rhetoric often positions the union as the authentic bearer of an SACP tradition, which has been abandoned by Blade and hi allies in the party. In other words, they essentially claim to be more ‘communist’ than the Communist party. For them the National Democratic Revolution has failed, because of the cowardice and betrayals of the leadership of the SACP and ANC. But as noted earlier elements of the workerist tradition still survive in Numsa, particularly among workers in the factories of the East Rand. The split from the tripartite alliance might finally open a space for a further set of theoretical and political debates. It might open up, in particular, the limitations of the Colonialism of a Special Type (CST) thesis and the subsequent two-stage theory of revolutionary strategy that emerges in the form of the National Democratic Revolution (NDR). These debates and the critiques of the NDR that emerged in the ’70s and ’80s are not new but are relevant once again, for they will take place in dialogue with an emergent movement, rather than in the fragmented remnants of the independent left. If there is to be an intellectual and strategic revitalisation of the left it will need to break from the myopia of SACP dogmatism through these debates. Numsa’s resolutions have so far met with very public and open hostility, somewhat predictably from the SACP, along with rumour, insinuations and suggestions that the ‘Numsa leadership clique’ was somehow part of a largely irrelevant socialist grouping – the Workers and Socialists Party (WAS ) – that had been removed from the Numsa congress. Another story doing the rounds was that Numsa planned to merge with Julius Malema’s Economic Freedom Fighters (EFF ). A rather standard tactic adopted by ANC hacks is blaming all opposition on some covert ‘third force’. 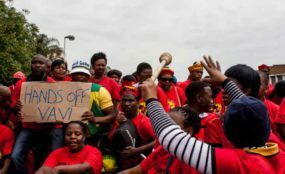 On the other hand, Cosatu, under the leadership of President Sdu Dlamini and his allies, has until recently been more taciturn in its responses to Numsa’s resolutions. Cosatu announced its unconditional support for the ANC in the upcoming 2014 elections, despite the ANC embracing the National Development Plan (NDP) (the Youth Wage subsidy by another name), its continued refusal to ban labour brokers and its general embrace of anti-worker economic policies. It should be noted that Cosatu undertook motions at its last national congress in 2012 to oppose all of these policies and force the ANC to change its policy paradigm. The situation within Cosatu is dire. Many affiliates are fighting for their very existence or are in an advanced state of decay, while a corrupt and distracted leadership jockeys for position on the NEC or the central committee of the SACP. The most grotesque example of this was Num’s reaction to the state’s murder of its own members at Marikana. The majority of workers killed that day still belonged to Num, which described its members as ‘criminals’ who were killed by the police in self-defence. Instead of sensing the mood among its membership, Num instead took the side of capital and the state, while tens of thousands of its members were in theprocess of defecting to the Association of Mineworkers and Construction Union (AMCU). Num, once Cosatu’s largest affiliate, chose to fiddle for the approval of Blade and Zuma, while Rome (the platinum belt) burned. Among others, similar examples of such leadership can be found in the South African Democratic Teachers’ Union (Sadtu) after the forced removal of its president, Ntola, and in the South African Transport and Allied Workers Union (Satawu) from which the NationalTransport Movement (NTM) split last year. The precarious current state of Cosatu cannot be over exaggerated. Its overall membership is in steady decline, wit many unions in complete disarray. ‘We had no choice but to convene this historic special national congress of Numsa to deliberate and break new ground.’ These words from the newly elected president of Numsa, Andrew Chirwa, during the opening of the Numsa special congress indicated that the Numsa moment, if one were to term it that, was a direct response to the crisis within Cosatu and the disintegration of the trade union movement. Cosatu’s response to Numsa was to send a letter to Irvin Jim demanding that Numsa make a case to the leadership of Cosatu why it should not be expelled from Cosatu. Numsa declined to respond to the ultimatum. This is part of the ‘constitutional process’ of expelling a Cosatu affiliate. According to Dlamini, ‘Numsa is trying to weaken and distract Cosatu’ and thus must be ‘dealt with’. A war room has been formed by four unions (Nehawu, Popcru, Sadtu and Num) in a bid to ‘save the tripartite alliance’ and get Cosatu’s efforts to campaign for the ANC in the forthcoming elections into gear. 1. Numsa is expelled from Cosatu. The nine affiliates split from Cosatu along with branches of other affiliates dissatisfied with their leadership and form a new a trade union federation. Cosatu is completely controlled by ANC/SACP loyalists and is pacified. The federation and its remaining affiliates continue to disintegrate, possibly with Vavi as the new general secretary of this formation, possibly merging with other independent unions. 2. Numsa is expelled, elements of other Cosatu affiliates regroup around Numsa, but no other affiliate splits from Cosatu. Cosatu is greatly weakened and is unable to represent workers. This scenario leaves the formation grouped around Numsa in a more difficult position than the previous scenario. Without the possibility of a future special national congress there seems no way to reclaim Cosatu from the Dlamini faction. It is on this position that politica strategy should be premised. The previous strategy of relying on the Dlamini faction to respect the Cosatu constitution will not serve the interests of those committed to saving what’s left of the trade union movement, apart from the symbolism and propaganda battle. The union movement urgently needs a new political direction to move it away from the toxic politics of the alliance and the ANC’s continual attempts to forg a placid union movement incapable of constructing a real opposition to the government’s neoliberal policy trajectory. But a new political direction will amount to nothing if there is not a return to the basic values of trade unionism: shop-floor democracy; and structures that encourage worker control rather than empowering an unaccountable bureaucratic caste comprised of people who are more interested in their personal finances and political careers than they are interested in the shop floor. With the government gearing up to take up the fight for ‘labour flexibility’ through its embrace of the NDP and a coordinated campaign to attract investment through a low wage labour regime, a strong, unified and politicised trade union movement is needed.